It’s often believed that Indian Railways is the largest employer in the world. And even if it’s not India, Chinese could be the largest employer in the world, given the size of population of these two countries. However, the World Economic Forum published a research to put an end to these speculations and declared US Department of Defense as the largest employer with a workforce of 3.2 million people. 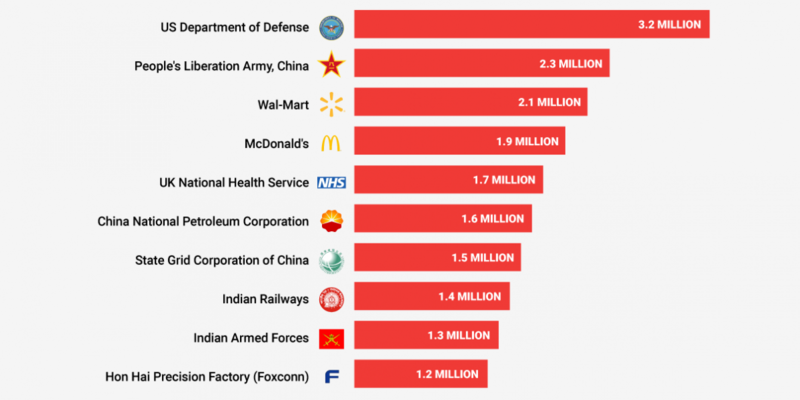 Interestingly, in their list of top ten largest employers only three are private companies – Walmart, McDonald’s and Foxconn. Here’s the full list of the biggest employers in the world. United States Department of Defense was formed on 18 September, 1947 as National Military Establishment, currently employs 3.2 million people. It’s an Executive Department of the Federal Government. Chinese People’s Liberation Army runs on the official motto ‘Serve the People’ since 1 August, 1927. It employs 2.3 million people. Walmart, the American retail corporation with chain of hypermarkets, discount department stores and grocery stores is the third largest employer in the world. It boasts an employee strength of 2.1 million. McDonald’s is the American hamburger and fast food restaurant chain was founded in 1940 and has 1.9 million people working for them in all over the world. McD currently has worldwide presence in 36,615 locations. National Health Service was established as part of the major social reforms after Second World War to provide comprehensive, universal and free health services to the people in the United Kingdom. It’s the fifth major employer in the world with 1.7 million people working for them. China National Petroleum Corporation is a state-owned oil and gas operation in China and the parent of PetroChina, the fourth largest company in the world in terms of revenue. CNPC employs 1.6 million people. State Grid Corporation of China is the largest electricity utility company in the world and seventh largest employer on the list. It has an employee strength of 1.5 million. Indian Railways is responsible for rail transport in India and boasts one of the largest railway networks. It employs 1.4 million people in India. Indian Armed Forces are the military forces of India and comprises of Indian Army, Indian Navy and Indian Air Force. 1.3 million people are currently employed by them. Hon Hai Precision Industry Co. Ltd. (Foxconn Technology Group) is a multinational electronics manufacturing company based in Taiwan. It’s the largest contract electronics manufacturer in the world and tenth largest employer with 1.2 million people.